JERICHO GOT SOME BUZZ THIS WEEK! Tad Delegal from Delegal Law Offices, P.A. 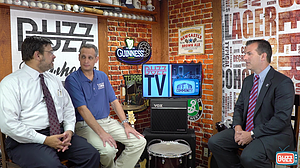 who is our Title Sponsor for our GOLF FOR AUTISM event April 29, 2017 and has been a tremendous advocate for The Jericho School for so many years, joined our Executive Director Angelo Martinez on BUZZ TV Tuesday Morning. Tad does so much for the Jacksonville community and has a great understanding of the importance of Jericho for families in this community who have children with autism. A BIG thank you to Tad and the Delegal Law Offices, P.A. for your continued support.